(6071, J. B. Milan Collection, OHS). A Cherokee chief, Dennis Wolfe Bushyhead was born on Mouse Creek near present Cleveland in Bradley County, Tennessee, on March 18, 1826. His father was the Rev. 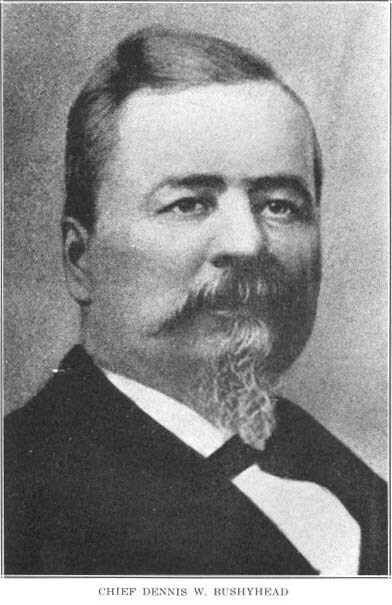 Jesse Bushyhead, who was a Baptist minister and a member of the Chief John Ross faction. Dennis Bushyhead began his education at the Candy Creek Mission in Tennessee and continued until his sophomore year at Princeton College. He removed to the Cherokee Nation, Indian Territory, in 1839. The California gold fields beckoned Bushyhead, and he left home in 1849. He returned in 1868 and served as treasurer of the Cherokee Nation from 1871 to 1879. In 1879 he was elected principal chief, an office he held until 1887. During his two terms as chief Bushyhead dealt with issues of importance to the Cherokee Nation that included railroad rights-of-way, land allotment, education, white intruders, tribal citizenship, and grazing rights. He was very much concerned with the individual citizens of the Cherokee Nation, as his personal correspondence indicates. In 1897 Bushyhead was a member of a Cherokee commission that protested the "proposal of the [United States] government relating to the extinguishment of our national title to the lands of the Cherokee Nation." Bushyhead married twice, had five children, and adhered to the Baptist faith. He died on February 4, 1898, and was buried in Tahlequah. Harold Keith, "Problems of a Cherokee Principal Chief," The Chronicles of Oklahoma 17 (September 1939). John Bartlett Meserve, "Chief Dennis Wolfe Bushyhead," The Chronicles of Oklahoma 14 (September 1936). H. Craig Miner, "Dennis Bushyhead," in American Indian Leaders: Studies in Diversity, ed. R. David Edmunds (Lincoln: University of Nebraska Press, 1980). Corie Delashaw, "Bushyhead, Dennis Wolfe," The Encyclopedia of Oklahoma History and Culture, https://www.okhistory.org/publications/enc/entry.php?entry=BU015.